Backgammon strategies and trading… Really? 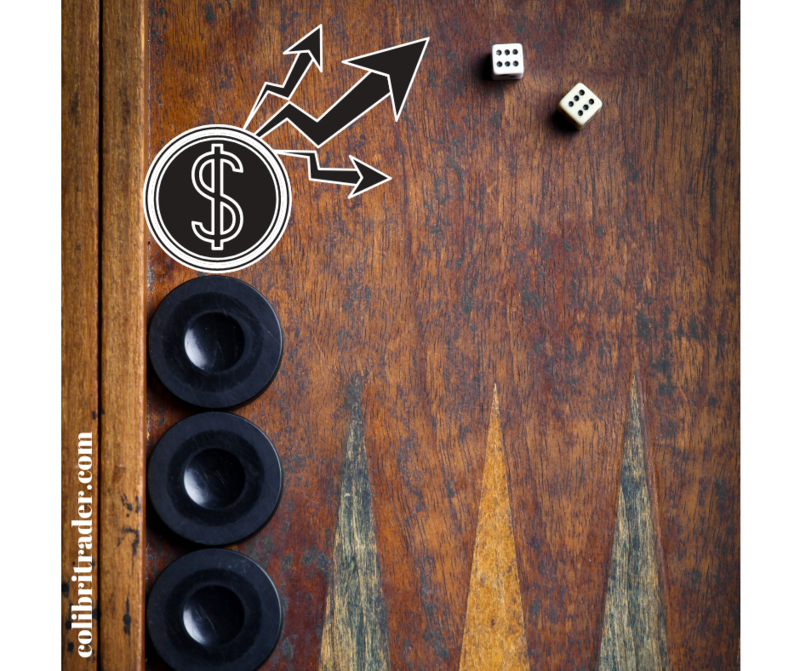 Can you really make money on the financial markets by using backgammon strategies? Probably yes- at least backgammon has helped me in certain areas of trading like strategy and new ideas creation. I have decided to write this article because I have been playing backgammon for a long time and find striking similarities in the world of trading and backgammon. I believe that backgammon is the game that is closer to the financial markets than any other game. Chess is similar, but with backgammon, it is different. Backgammon relies not only to luck but on skill too, so I believe there cannot be a better game to play that can show you so precisely the qualities you need to posses to be a good trader. This article will continue with a few of the major ways to play backgammon and how they relate to trading. Please leave your comments in the comments box below this article. For a lot of you backgammon is probably something new. You don’t need to be an expert to understand this article, although it could help if you know the rules and the aim of the game. I will try to briefly explain it here in layman’s terms. To play backgammon you need two players. As you can see from the screenshot above, the “triangles” are alternating in colours. The quadrants are known as the “outer board” for the opponent’s field and the “home board” for your own field. The ridge in the centre that separates the board is called “bar”. The triangles are numbered and the one in the lower right corner is “1” and then numbers goes clockwise. The last number is “24” and it is the one in the upper right corner. You and your opponent are both equipped with 15 checkers or pips of his own colour and above you can see the starting arrangement of the game. The game’s objective is to move all your checkers (pips) in your home board and then bear them off. The player who manages to bear off all pips first wins the game. Not too different from trading, where your opponent are the other market participants. Just like trading, backgammon is a zero sum game- there is only one winner! The reason why in the beginning of this article I mentioned that luck plays some role in this game is because players are using dice to decide their moves. I am sure you can already see the resemblance between backgammon and trading. Whereas the dice decides the number, it is ultimately down to the player to decide how to play that number! NB: It is the skill of the player that will decide the outcome of the game in the majority of the cases. Hence, there is another great resemblance between backgammon strategies and trading. Just like taking risks when trading, backgammon strategies (as you will see later) do incorporate taking risks and trying to protect yourself from the other player. In this section, I won’t give too many details about the way to play each and every backgammon strategy due to the limited nature of this article. I will just use a few of the most popular backgammon strategies and relate them to the world of trading. By the end of this article, you should hopefully be able to pick up a few useful tactics or approaches to trading that might stay with you for a long time. So, pay attention and as always- ask questions! You will certainly not get everything, so the more you participate in the comments section, the better. Also, if you have any specific questions, send them directly to admin@colibritrader.com, where I will pick them up! The objective of the Running Game is to bring all your checkers (or pips) into your inner board and bear them off as quickly as possible, similar to a competitive race. A running game is the only type of game where the dice have a decisive say in the outcome. The player getting the higher numbers (provided he makes no movement errors) is normally the winner. This is not the type of backgammon strategy that will fit my personality. When trading, I prefer to stick to strict rules. Relying on dice or very short-term market movements has never been my forte! The less you rely on the dice, the better player you become. Holding games occur when one side escapes his back checkers to the safety of the midpoint or beyond, but the other side (the “defender”) does not. Instead, the defender manages to anchor his two back checkers somewhere in his opponent’s home board. The holding game approach reminds me of the moment between winning and losing trades. The professional trader knows from experience that after winning streaks, losing streaks are on the horizon. What he/she can do is to patiently wait for a better moment to come. In such moments, the best thing one can do is to patiently wait and don’t rush things. The more you rush, the less powerful a backgammon (trading) strategy becomes. Rare gems are always hidden! Priming is basically the tactic of lining up one’s backgammon pieces in a row with the intention of creating a wall mainly to hinder the movement of the opposite side’s pieces. Putting up a wall of one’s pieces will effectively trap the pieces of one’s opponent, giving one an advantage as long as one’s ‘prime’ stands. When playing backgammon for money on the other hand, another vital objective of the priming game strategy aside from obstructing enemy piece movement is hitting the opponents blot and trapping it using the wall of backgammon pieces that one has put up. This backgammon strategy reminds of scaling-in when you are in a winning trade. The more your position equity is growing, the more you are adding to your position. Not necessary a winning approach, but with the right trading tools in place, a scaling-up tactic could be extremely powerful. In fact, my trading strategy is very similar to this approach. I am maximising the possible return from every winning trade, while minimising the harmful effect to my P/L from the losing trades. As we traders say- let winners run and cut losses quickly. The idea of the blitz is to barrage your opponent by hitting him and making points and hopefully, if you are successful, closing him out completely so that he has one or more checkers on the bar while you proceed to win a gammon or backgammon. If you want to have a successful blitz, you must have a lot of ammunition in place; you must be unrelenting; and you must focus your resources on one area of geography—your inner board. A very philosophical approach. This backgammon strategy reminds of the importance of trading psychology. A trader must have a lot of patience and be persistent in trading. You must concentrate on your mind and look deeper inwards as opposed to outwards. In the end, the best traders are the ones that learn how to manage their emotions. The best traders are the ones that know how to handle market volatility, even they are taken in a “blitz of a moment”. The two-way forward game is not listed as a basic plan, because it is a hybrid of the blitz and prime games. In the two-way forward game, you normally have built a mini-prime of 3 or 4 points, and then have the opportunity to attack your opponent. If your opponent anchors, you hope to have extended your prime in the process and to win from a priming game. Two-way forward games are extremely strong when they come up, because if the dice go badly for one plan, they often go well for the other. A good trader always knows that he/she must expect the unexpected. The professional trader knows how to look at a trading setup from different angles. The more time you spend on one and only one possible scenario, the more you will find yourselves losing. Successful traders are able to expect things and see the way a certain situation will untangle in ways that other market participants are not. In the end, it is always useful to have a B-plan and stay cautious at all times. The Back Game is achieved by controlling two (or more) points in your opponent’s inner table. The main game objective is to hit a blot late in the game and contain it. It is a difficult strategy to play in backgammon because the chance of a successful Back Game is influenced by the luck of the dice roll. By definition, a back game means that you are holding a couple of points right at the back of your opponent’s board and not too far along. You can see why it is such a risky strategy. If you don’t get some good opportunities to hit, you can pretty much kiss this game goodbye. This backgammon strategy remind me of all traders that are trying to “outsmart” Mr. Market. Trying to catch a falling knife is a dangerous and expensive business. Instead of following the trend, the majority of traders find it very appealing to try to “invent the wheel” and go against the major trend by hoping that they will get lucky this time. I have seen so many traders losing fortunes by sticking to this approach. Just like in backgammon, when trying to rely on pure luck in trading is never a recipe for success. Parkinson’s Law: The more you want the market to go in your preferred direction, the quicker it runs away from you! Stacking your checkers together will give you less safe places to move to in later moves and thus leave you more exposed to being hit later on in the game, when it hurts much more. In the early stages of the game you should be taking more chances, before your opponent has had the chance to make some points on his side of the board. Just like in trading. The earlier you are positioned in a trade, the more times you should be trying to establish a position with smaller attempts. The later in the process you are of building a profitable position, the more risk-averse you should be. Backgammon strategies are very much alike trading strategies. The only difference again is in the amount of risk you are willing to take and at what time you are willing to call it a day!